Honeywell Life Safety System brings you Variodyn the world’s only 'All in One System', with more functionality, flexibility, clarity and complete reliability. The one you need for today's emerging and complex world. Variodyn is one system which truly defines the term “All in One System”. It allows automatic evacuation under permanent surveillance, signal distribution, flexibility of integration with other systems, extension of existing system, improved performance and user friendly. 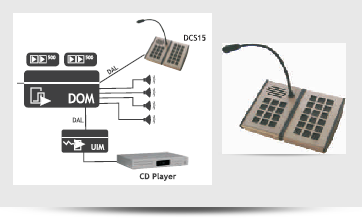 Integrated call stations and free programmable functionality. Easier extension of existing systems with new subsystems or additional components and functions over existing LAN networks. Reduced costs due to limited number of components. Architecture facilitates reduced cabling and use of existing LAN networks for integrating larger systems. Digital storage of voice announcements. Interfaces to fire alarm systems, security systems etc. Self monitoring system in real time. The VARIODYN D1 network configuration opens up new horizons: multiple system units can be networked and even whole networks are involved. It's easy with good standard equipment via Ethernet. Even the diagnosis on the World Wide Web is possible.